Tomatoes- Hello everybody, welcome back with ZetiraKitchen! Today i will share about 12 facts tomatoes. Tomatoes as we see in the kitchen, the shape is oval, the meat contains a lot of water and has a thin skin surface, small green stems, and various colors. Tomatoes are usually served with salads, or made into sauces, processed into other delicacies such as pasta, soups, as side dishes, fresh juices, and other preparations. Besides for cooking ingredients, because it is rich in vitamin C content of tomatoes in one of the basic ingredients for beauty products such as masks, skin, and lip moisturizer. Even the cast has been known as an herbal remedy used for hundreds of years. The amount of nutritional content in tomatoes makes it much sought after. Does tomato have danger? yes, you can't keep tomatoes too long in the refrigerator. Studies at the University of Florida have shown changes in tomato DNA, so that fresh flavors in tomatoes are turned off for a period of time. Even though it has the shape and skin that is still bright, tomatoes that are stored too long in the refrigerator also produce different flavors. I suggest that you keep tomatoes up to 3 days in the refrigerator to keep your tomatoes fresh. So now let me tell you the facts about tomatoes! The first tomatoes in Europe were yellow varieties. They were first brought to Europe in the mid 1500’s. Tomatoes increase in weight as they ripen, even after harvesting. Tomatoes are the richest source of lycopene which is important for the health of the prostate gland in men. A tomato is a fruit not vegetable. There are over 10,000 varieties of tomato, these come in a variety of colours including pink, purple, black, yellow and white. Can help protect against cancer, maintain healthy blood pressure, and reduce blood glucose in people with diabetes. Eat more tomatoes as these preparation methods can boost the availability of key nutrients. 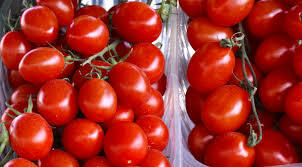 Tomatoes are in the top ten fruits and vegetables for containing levels of pesticide residue.